Want to share your own experience with us? Send us a note to let us know what working with Home Downsizing Solutions by The Sierra Group LLC has been like for you. 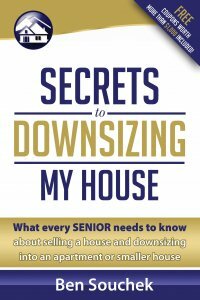 When we decided at our advanced age, to downsize and sell our home after 44 years of wonderful memories, we were overwhelmed! The Sierra Group had been recommended to us, and as soon as we had our first contact with Ben Souchek, we knew that we had made the right decision. He personally handled the entire transaction– (having the house inspected) and explaining each step through closing, which went quickly, with terms and cash exactly as agreed upon, and with almost no effort on our part. Another big plus was allowing us to stay in our home for two months while making decisions on what “treasures” to take with us and what to leave behind. ….we were impressed with your company’s professionalism and efficiency. When it became apparent that I needed to move I looked at using a real estate agent but found that this could, based on the current market take a possible extended duration of time. In talking with the people at John Knox Village, your name and company was suggested as a possible way to shorten the needed time for sale. I checked the internet for current real estate selling price in my area to find a possible sale price. I then checked with your company concerning the possible sale of my house. Shortly after contacting you a member of your staff came to my house for a walk through. He was very courteous and professional. Your quote was within the parameters I had determined in my study of real estate agent sale. The major selling point was the very short period needed to complete the sale of my house. 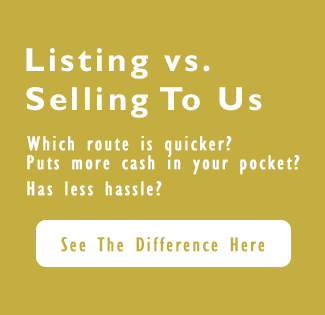 The second selling point was that there were no showings required and the repairs that would be required to obtain the money in hand I wanted would be done by you with no involvement required on my part. The third selling point was your involvement and professionalism shown to me on all occasions. Would also note that all promises made by you & your company were met. I have no problem in recommending you & your company to anyone. Thank you. As Gordon and I embark on a new phase in our lives we have Ben & Sierra Group to thank for this blessing. We have sold three homes and have never been treated with such an informative & caring way as Ben exudes. He saved us so much grief (going through regular real estate procedures). Ben’s way and the highway was the best way. Mr. & Mrs. Gordon H.
Ben, I wanted to take the time to thank you and your amazing colleagues for making the sale of my parents home an absolutely wonderful experience. You were clear up front about the process and what we could expect on your end and I can say without any hesitation you went above and beyond our expectations relative to you doing what you said you would do. The flexibility, patience and understanding you demonstrated while dealing with the unpredictable status of my elderly parents life was exemplary and I cannot thank you enough for understanding my parents personal issues and challenges. The process was easy, simple and reduced the amount of challenges that are typically associated with a real estate transaction. Working with your firm and those colleagues that support you was the perfect fit for my family and I would without any hesitation recommend you to others that are interested in selling their home. I would tell them that they can expect empathy, honesty, integrity, flexibility and a personal touch that is rare but in this case very real! My parents are incredibly thankful as am I and they are in a much better living situation that they both deserve. I wish you nothing but continued success in the future. I have no doubt that you will continue to do so because you have a winning formula! Just a note to thank you and your Sierra Group (and assistants) for easing the process of selling my home. Specifically your enterprise has saved me a great deal of time, energy, and the expense of paying the substantial prices of commissions, inspections, repairs, escrow, closing costs, warranties, etc. And, perhaps most importantly, thanks for relieving me of the perpetual on call status of accommodating an endless parade of maybe seriously interested strangers wandering the rooms and nooks and crannies of the personally enhanced spaces in which my wife and I have lived our private lives for two and a half decades – the relief of a quick, efficient, and reasonable closing was truly a most positive asset. Thanks again, Ben – I wish you the very best.